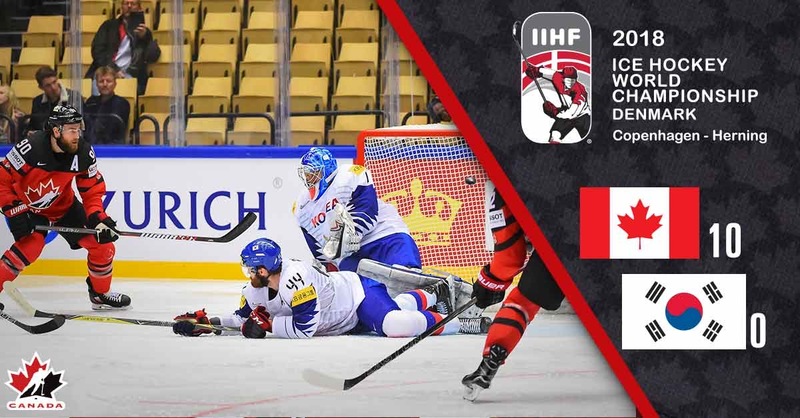 While much of Canada slept Sunday morning, the team battling in our name at this year’s IIHF World Championships in Denmark swept past South Korea by a score of 10-0. Maybe you woke up to watch the TV broadcast, but if not, and you relied on tidings from the internet, then it’s possible that you saw the victory framed as a kind of gratis Royal Caribbean vacation on the IIHF’s news-feed, where the headline over Andrew Podnieks’ report read: Canada Cruises At Korea’s Expense. A Team Canada “made up of NHLers started gently but poured it on,” he wrote. On Twitter it was deemed both a convincingand a dominant win; the Koreans were duly thrashed (Sportsnet.ca) and demolished (Hockey Night in Canada). Was that really necessary, though? It’s the question that comes up after lopsided wins against lesser opponents, if not for those players on the ice perpetrating the lopsiding, then for some certain observers at home with an interest in sportsmanship and mercy. Could the Canadians have let up a bit yesterday — after, say, Pierre-Luc Dubois scored in the second period to make it 5-0? Or what about closing it down for the third, at the start of which Canada, ranked first among hockey nations, was leading the Southern Koreans, 18thin the world, by a score of 8-0? Wouldn’t that be a kinder way of administering a whomping? There’s no easy answer, of course. You can’t really expect a parcel of NHL players notto do what they’re trained to do, i.e. skate and score right to the end. And in a round-robin tournament, wherein goal-difference can be a deciding factor, there’s no such thing as an excess of goals. If you want the original written ruling on the matter, well, in fact the book that’s considered to be hockey’s very first has something to say. Arthur Farrell, a Hall-of-Fame forward, published Hockey: Canada’s Royal Winter Game in 1899, the same year he helped the Montreal Shamrocks to the first of their two successive Stanley Cup championships. Over the course of 122 pages, Farrell waxes long and eloquent on everything from history and equipment to conditioning and tactics. Sound advice, I guess, though I’d maybe prefer to hear it direct from the badly beaten and downright discouraged themselves. Were the Swedes glad to go unpitied to the tune of 12-1 when the met the Canadians at the Antwerp Olympics in 1920? What about the team they sent at Chamonix in 1924, losers to that year’s Canada by 22-0? One last case study might be worth considering. Austria hosted the IIHF’s 1977 World Championships in Vienna, though they didn’t have a team in the tournament, and so didn’t have to worry about humiliations on the ice. Not so Canada. Here was a rare of instance of one of ourteams finding itself at the suffering end of a rout and, with it, a chance to see how we’d react. Canada was back at the Worlds for the first time in seven years, and this time they’d be icing a team of professionals. Not quite the front-line accumulation that had won the 1976 Canada Cup, of course: this one would be staffed by NHLers from teams that hadn’t made the playoffs, or hadn’t lasted far into them. GM Derek Holmes had marshalled Jim Rutherford and Tony Esposito for the Canadian goal, Dallas Smith and Carol Vadnais on defence. Pierre Larouche, Ron Ellis, and Rod Gilbert were up at forward along with captain Phil Esposito, who was also named as a playing assistant to coach Jimmy Wilson of the Colorado Rockies. Things did not, shall we say, get off to an auspicious start in Europe. After a pre-tournament stop in Sweden, the Canadian played West Germany in Dusseldorf, where they won, 8-1, in a penalty-filled game, and were jeered by 10,000 fans, many of whom threw their seat-cushions on the ice when it was all over. A report in The Globe and Mail insisted that the barrage was ironic, “mock rage that actually was a favorable reaction to the hard hitting and sometimes cheap penalties the Canadians received.” As for the German press, they reported that Phil Esposito might have been drunk. The Canadians did peaceably dine with the Germans, post-game, I should report. Then they left for more exhibitions in Prague. “That is when it is down to serious business,” Esposito confided. In Austria, there was a kerfuffle regarding the IIHF’s insistence that all players wear helmets. Several Canadians complained, saying headgear gave them headaches, and the team doctor gave them medical certificates to that effect. But the IIHF wouldn’t relent. Unhappy, the Canadians still fared well enough in their opening game, beating the US 4-1. The next game didn’t go so well: the Swedes we took such care to whup through the 1920s now prevailed 4-2. Next up, the powerful Soviet Union, winners of the two most recent Olympics as well as eight of the previous ten world championships. They had Vladislav Tretiak in the crease, and ahead of him, the likes of Alexander Yakushev, Boris Mikhailov, Valeri Kharlamov, and Helmut Balderis. Final score: USSR 11, Canada 1. And how did Canada respond to finding itself thrashed and demolished and paying for Soviet cruising? That’s as gracious as we got. On to self-doubt and recrimination. “It was humiliating,” coach Wilson said. GM Derek Holmes announced his disappointment, which was bitter. Montreal’s Gazette topped its front page the next morning with the bad news, leading with a story that included the words worst drubbing, romped, embarrassingly easy, poor sportsmanship and shoddy play in the opening two paragraphs. 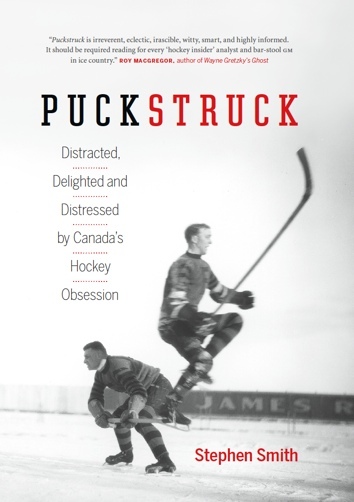 “The prestige and credibility of Canadian hockey was destroyed on the banks of the not-so-blue Danube,” George Gross wrote in The Toronto Sun. In the hours that followed, politicians in Ottawa took up the cry, with Ontario NDP MP Arnold Peters calling for Canadian hockey officials to be called to face a House of Commons committee to explain why we’d sent “second-rate players” to represent us. Canada did go on to post a 3-3 with the Czechs, the eventual champions. We finished fourth in the end, just behind the Soviets. Back at the rout, Al Strachan of The Gazette was on hand to document Canada’s failure to heed Arthur Farrell’s 1899 guidance on going goon in a losing effort. 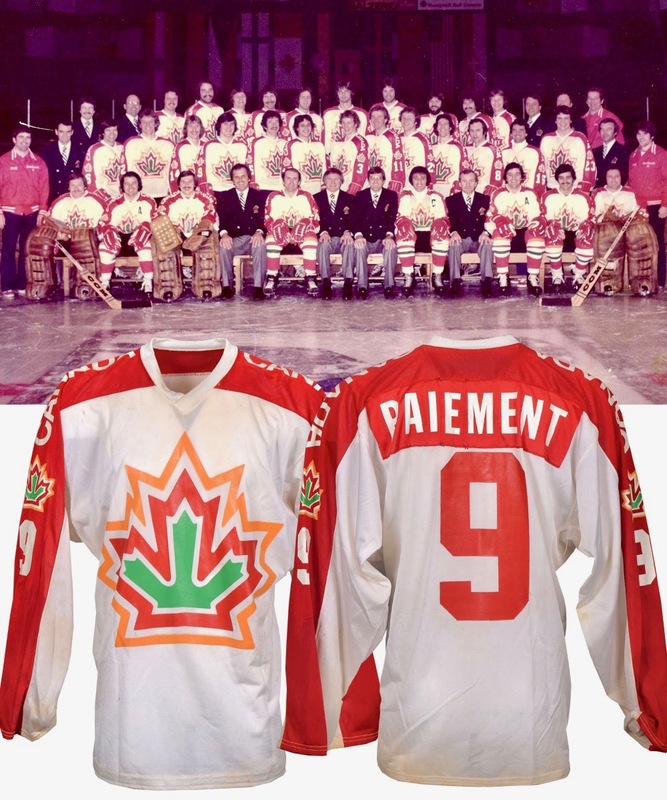 Rod Gilbert “swung himself off his feet” taking a “a vicious two-handed swipe” of his stick at a passing Soviet, while Wilf Paiement “acted like a malicious buffoon” swinging his stick at, and connecting with, the head of another Soviet player. “I figured I might as well hit somebody,” he said, later, “maybe hurt somebody. I don’t know. I wanted to do anything to win.” Canada was down at the time by 8-0. You’d think those Soviets would have shown show respect, but no, they kept on with the scoring. Having argued to avoid putting helmets on, some of the Canadian players now refused to remove them once the game was all over and the teams lined up to hear the victor’s national anthem.